Watauga County now operates an on-site household hazardous waste collection facility, as of April 2016. 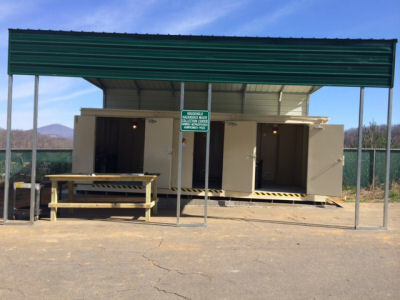 This new facility promotes the proper disposal of hazardous materials that are produced by residents of Watauga County. Household hazardous materials are collected at this facility free of charge. Please see below schedule for times of operation for the HHW Facility. The HHW (household hazardous waste) facility is equipped to accept a variety of toxic materials such as; household cleaners, paint, varnishes, stains, paint thinner/remover, solvents, pesticides, automotive liquids, mercury items, light bulbs, batteries, etc. It is very important to dispose of these items correctly in order to keep ourselves and our environment safe and toxic free. The HHW building is equipped to accept only hazardous waste from Watauga County residential homes. Hazardous waste from Commercial/ Business use is NOT permitted. Never leave any hazardous waste materials outside the facility if the site is closed. Household hazardous waste is not collected at any other time/location other than that specified. Never Mix any toxic materials together. Always store your HHW items in your trunk or truck bed, or trailer- away from children and pets. Make sure it is safely secured to avoid harmful spills. Residents must enter the facility through the scale house and inform the scale operator that they have HHW materials for disposal. Operator will direct you to the facility and inform HHW attendants of your pending arrival. Turn off your vehicle once you reach the designated collection facility- No Smoking! Stay in your vehicle- this is for your safety and convenience. Please inform the HHW facility attendant of the type, quantity and the location of your hazardous items. The attendant will carefully and respectfully remove the hazardous waste materials from your vehicle and take them to their proper storage location inside the building. With permission from the attendant, please exit the facility with caution and yield to any incoming/outgoing traffic. Watauga County collects household batteries and compact fluorescent light bulbs during regular business hours at all 10 of our Convenience center sites. Collection bins are located at each site attendant’s building. Larger 4ft-8ft light bulbs and car batteries are accepted at the main recycling facility only which is located at 336 Landfill Rd. Boone, NC 28607. Please see the list of Convenience Center locations to find the facility most suitable for you.